At the backyard of his house in Jirala village, Pradeepta Nayak carefully selects delicate rice straw strands, separating the dark brown coloured ones from those having a golden hue. In a small room few metres away, a group of women are creating a massive painting of Lord Krishna playing flute for Radha, in a garden replete with blooming flowers. The painting resembles Raghurajpur’s Pattachitra (scroll painting) although, the medium here is not natural dyes but rice straw. And instead of painting brushes, the women are drawing with scissors, literally. The sleepy village of Jirala in Dhenkanal district is today synonymous with straw painting. It has carved a place for itself in the art map of Odisha due to the efforts of Pradeepta, who is the lone craftsman in the State practicing and promoting straw painting. Considering beauty of the art form, the Dhenkanal administration has now roped him to train others in the craft. 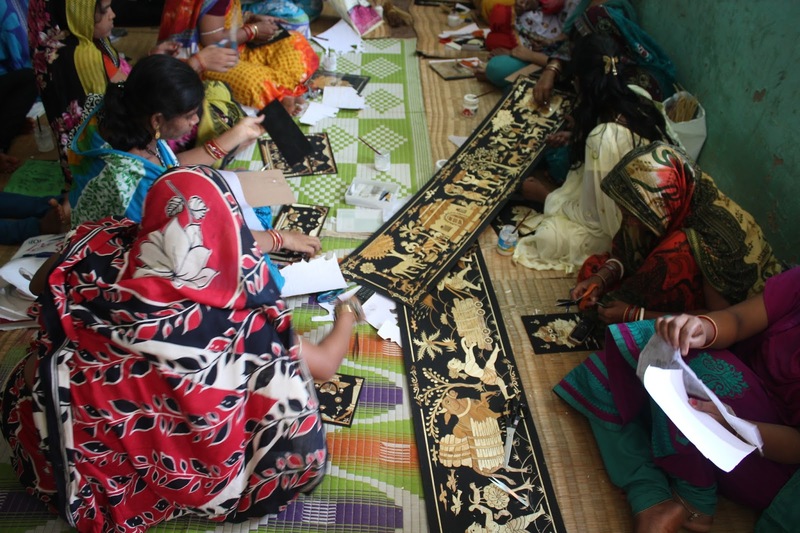 Currently, he is training 50 women free of cost at his Kalyani Straw Craft Centre in the village. In the last 15 years, he has trained at least 200 youths across the State in the craft for free. It all started as a hobby to create art out of waste, 25 years back. “The State Government recognised rice straw painting as a craft very recently,” says Pradeepta, who started participating in all major handicraft exhibitions across Odisha two decades back to showcase his craft. He drew inspiration from the Pattachitra style of painting of Raghurajpur. The craft is time-consuming, he says, while demonstrating the tedious process. Each strand of straw is carefully split into two halves with the help of a knife. He then flattens it with a pestle and pastes it on a sheet of A4 size paper. 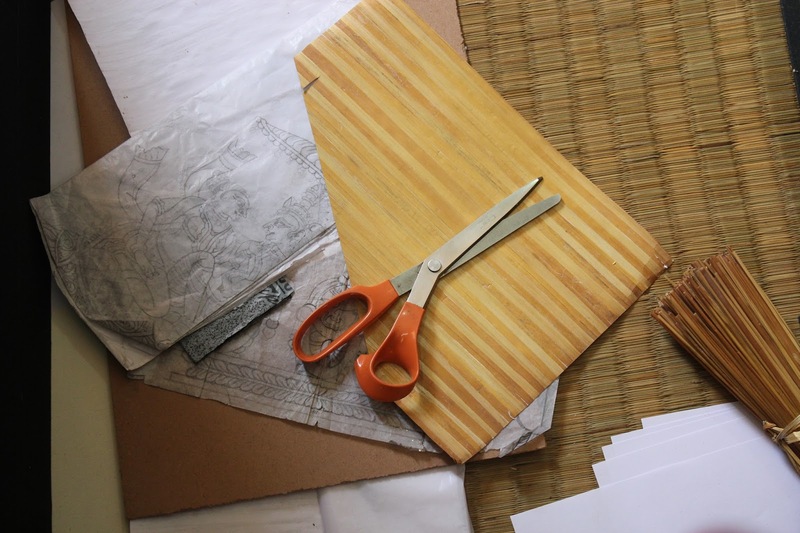 After drying, the paper is cut into desired shapes and sizes for the straw paintings. Each A4 size paper requires at least 25 straw strands, says the master craftsman. The subject of the painting is drawn on a butter paper, which is then replicated on the straw sheet. The design is then meticulously cut out in thousands of pieces of designs and pasted on the canvas, which is made of thin plywood sheet covered with black velvet. “Since the colour of the straw is golden, the painting comes out beautifully on a black canvas,” he says, adding that heaps of straw are left to dry in sun for five to six months before it attains a shiny golden hue and is ready for use. The subjects are drawn from local folklore, Indian mythology and Jagannath Culture. Sometimes, nature also finds space in the paintings. Recently, Pradeepta created a life-size painting of the Holy Trinity – Lord Jagannath, Devi Subhadra and Lord Balabhadra – in ‘Nagarjuna’ Besha (attire), where he painted the deities as warriors seated atop a pedestal in the sanctum sanctorum of a Jagannath temple. The detailing in the painting would leave any art connoisseur mesmerised. In a similar painting, he creates a Kandarpa Ratha (Cupid Car) in which, a group of gopis (cowherd women) form themselves into a chariot that their beloved Krishna rides with Radha. In another, bodies of the gopis are arranged in a manner as to create impression of an elephant and seated atop the animal are Krishna and Radha. Farmers at work in their agricultural fields, tourism destinations in Odisha and sunset at Chandrabhaga with Konark Sun Temple in the background also form a part of his oeuvre. Pradeepta shows a horizontal canvas in which he has painted a village scene where farmers are getting ready for a new crop season on the occasion of Akshaya Tritiya. 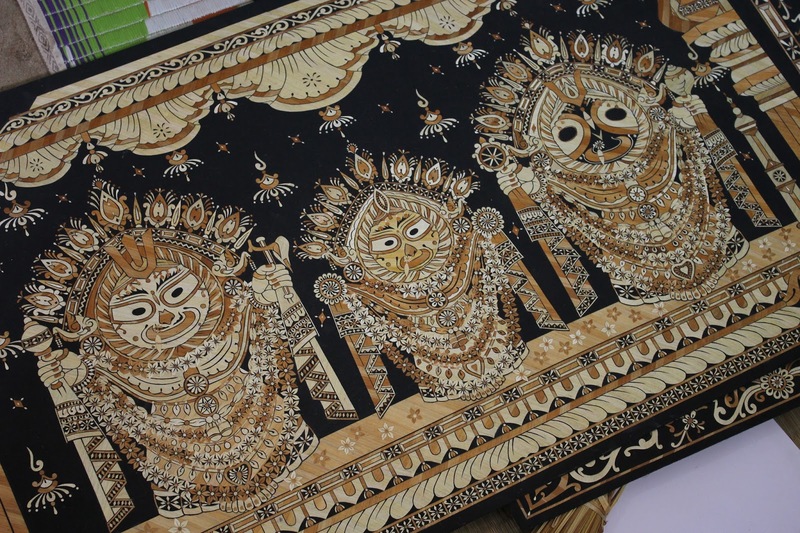 “The Kandarpa Ratha and Jagannath Besha themes are famous among buyers,” says the artist, who set up his craft training centre in the village 15 years back and has been running it with the money that he earns from selling the craft. “The paintings that are created in the centre by trainees are sold through exhibitions and 30 per cent of the income goes to them,” he says. Pradeepta dreams of a crafts village tag for Jirala like it has been in the case of Pipili (appliqué craft) or Raghurajpur. “If the Government pays a little more attention, Jirala can produce several more artisans in straw craft. Now, very few men have interest to practice this time-consuming craft. It is only women, who have the patience to learn it,” he adds. Passionate about de-mystifying the world of travel, my interest areas are monumental heritage and eco-tourism. Different cultures and cuisines fascinate me.